The Sonoran Desert is beautiful. I don’t remember what I expected when I first moved here in 1993 to go to Grad School, but it’s even more amazing than I thought back then. I have since learned so much more about the desert and love it more as I learn about the adaptations of the plants and animals. My first view of the desert was similar to the one above. The mountains surround Tucson, so no matter where you are, you can see one of the mountain ranges, if not more. The Catalina mountains are to the North, the Rincons to the East, the Tucson Mountains to the West, and the Santa Ritas to the South. I made it a point to learn all I could about this beautiful place. And I took a lot of pictures then and still do. The closest mountains, and the biggest, are the Catalinas. A drive to Mount Lemmon at around 10,000 feet is heaven in the summer when the temperatures in the valley routinely reach 100 or more. Mount Lemmon might get into the low 80s on a hot summer day but a walk into the pine forest is cooling and soothing. 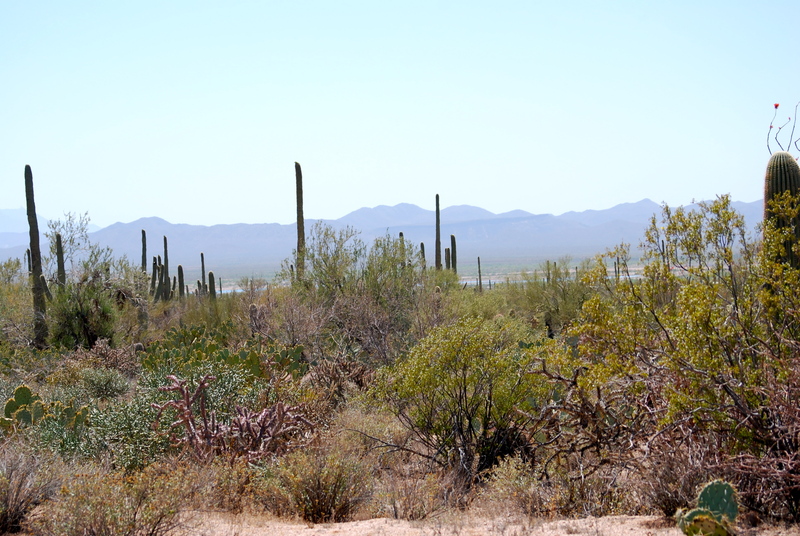 These are Saguaros (pronounced sawaro) , perhaps the cactus best known for being here in the desert. They grow mostly on the southern slopes, bloom in May, and fruit in June. 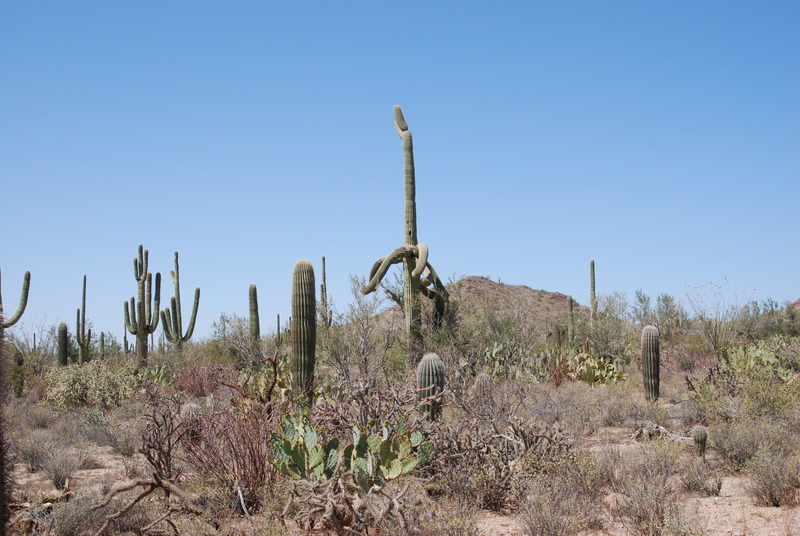 Arms appear when the cactus has reached at least 50 years of age, so the one in the middle with many huge arms is much, much, older than that. 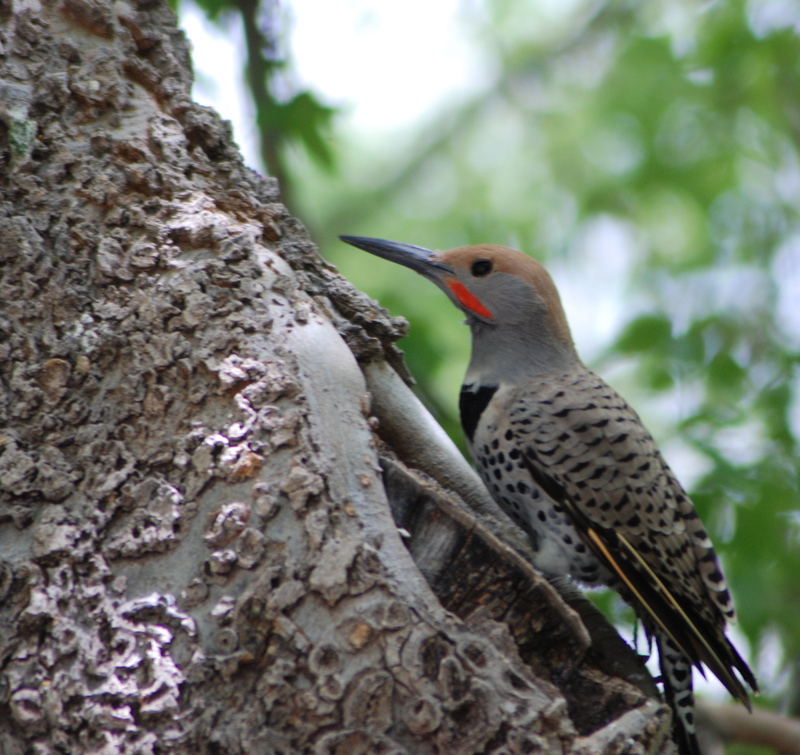 The Gila (pronounced Hila) woodpecker is one of the many birds here. 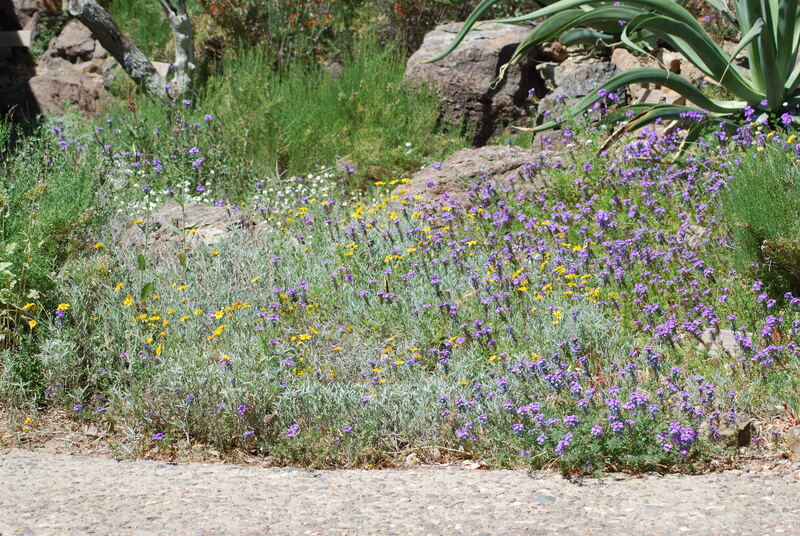 And there is nothing more beautiful than the desert when the wildflowers are in bloom. When I was young, I would look at older women with their round bodies and flabby upper arms and think how ‘grandmotherly’ they looked and swore I would never look like that. Now I know that there isn’t a whole lot I can do about my body shape; the flabby arms; and no way am I ‘grandmotherly’ even though I have three grandchildren. When I was a young woman, I thought getting married, settling down, having kids, was the be-all and end-all of my existence. It wasn’t. During the marriage, having to support the family, going through living with an addicted personality and the pathological lying, I wondered what I had been thinking. I was raised in the time when women weren’t supposed to have a career, be good at math and science, or be anything other than a nurse or a teacher while waiting for a proposal. Now I know how wrong that all was for me. When I was around forty, I decided to go to college for the first time. My counselor at the Junior College told me there was no way I could go to school full-time, work full-time, and get decent grades. He was a young 20-something who looked like he was still in school himself. And he was wrong. After I graduated from Junior College, I went on to University, and earned a BA and an MA. Perspective changes depending on where you are. As a young child, I couldn’t imagine being the age of my grandmother. But here I am. I couldn’t imagine not being married and having a family, because that’s what was expected of me. Looking back, I know I was good at math and science and sometimes wish I had had the fortitude to do what I wanted to do instead of what was expected of me. I don’t regret my marriage; it gave me my two sons and eventually their children. And it taught me about who I am and how much I can endure. During that time, I began to grow and emerge from the shell I had built around myself as protection. I opened myself up to new knowledge, new experiences. After my divorce, I didn’t know how to redefine myself. I was in grad school at the time, and all my classmates were the same age as my sons. There wasn’t anyone my age to talk to who would understand. But I made it through. In the years since then, with a lot of reflection, reading, listening, I like who I have become. I don’t live my life the way I’m expected to live it by those around me. I live my life for me. I do what I like to do because it makes me happy. I learn what I want to learn and will share my knowledge and wisdom with anyone who wants it. I am not perfect and probably never will be. I continue to grow and change and learn. And that’s all any of us can ask for. I read this little gem yesterday in “A Cherokee Feast of Days” by Joyce Sequichie Hifler. It’s a book of daily meditations that I found in a used book store several years ago. The daily readings are always thought-provoking, but this one really hit home yesterday, even though I have read it every June 30th for a number of years. The point is, that many of us believe our inner (or outer) critics that daily tell us we are unworthy, that we will always be victims of bad relationships, sickness, poverty, etc. and that there is no way out. Much of this ‘chatter’ is not conscious most of the time. But we catch ourselves sometimes thinking we don’t deserve a good life, or we will never be successful. In my case, my mother constantly barraged me with how stupid I was, and I believed her for a long time. It was only later in life that I understood I was not like her, and I was not stupid. It took me a long time to understand that. This negative mindset is hard to overcome, especially when it is reinforced by parents, spouses, or society in general. We tend to internalize society’s view of us. But we can change our patterns of negative thinking. If we think we are not worthy, we will seek out people and experiences to reinforce that. It’s what my friend Bonnie calls Monkey Mind (http://www.savoringyoursixties.com/blog/) and it can be destructive to our own peace. If we think we deserve the good things in life, that is what we will find. I know it took me a long time to change my thinking, and there are still times I catch myself thinking I will never get what I want. Half the battle is knowing what we want; if we don’t know what we want, we can’t take steps to achieve it. It’s too easy to live in the past and moan all the what-ifs. Or to focus too much on the future with dread because we are afraid of what might happen. Worry is exhausting and saps our energy so we can’t focus on where we are now. No matter what is going on in my life, I can find good in myself and in my situation. I tell myself I deserve good things; I tell myself I am a good person; and I focus on what I love and on positive ideas, people, situations. I have survived bone-crushing poverty; divorce; grad school; homelessness; unemployment. None of these things broke me; I’m still here. I have a good life, and that is the best revenge.